Which would you choose and a Scout tote giveaway! Hello hope your week has been a good one, not a bad way to end it with a giveaway! Hard to believe it’s the last week of summer! !Lets soak up that fresh air and those feel good sun rays while we can. Last week was a really full week, we had a photo session which I cannot wait to show you pictures of. 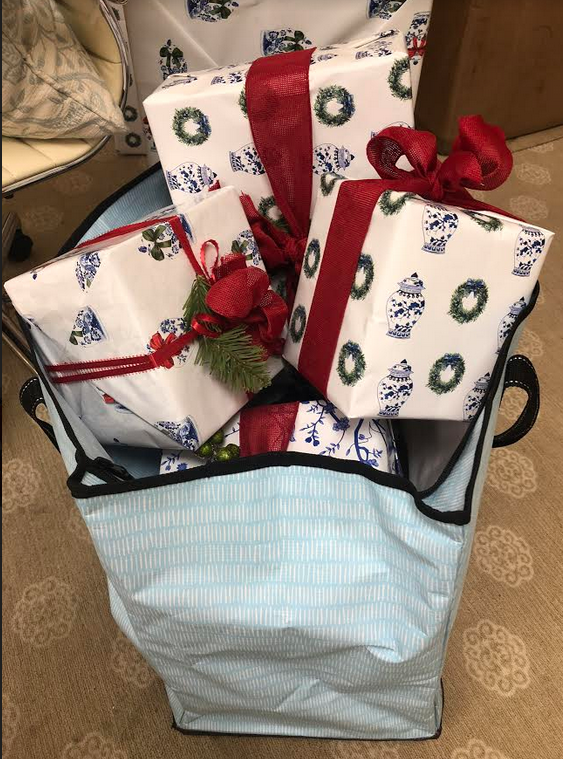 I laughed because at one point I needed to transport a bunch of both big and small wrapped gifts for the photo shoot with literally not a second to spare, and in a rush, I grabbed my huge Scout tote (the 4 boys tote) and managed to put everything in there (see below). I am talking there were at least 14 gifts in this bag! Scout tote to the rescue! Today I have partnered with Scout to offer a BAG GIVEAWAY and a 15% DISCOUNT OFF OF ALL PURCHASES for my customers only! I think I will need to take advantage too:) With the holidays upcoming, these make fabulous gifts as well. Good looking, priced right, never gets dirty, doesn’t tear or rip, what more can you ask for! OK your turn to choose tour three faves, I could easily close my eyes and point and be thrilled with any of these. 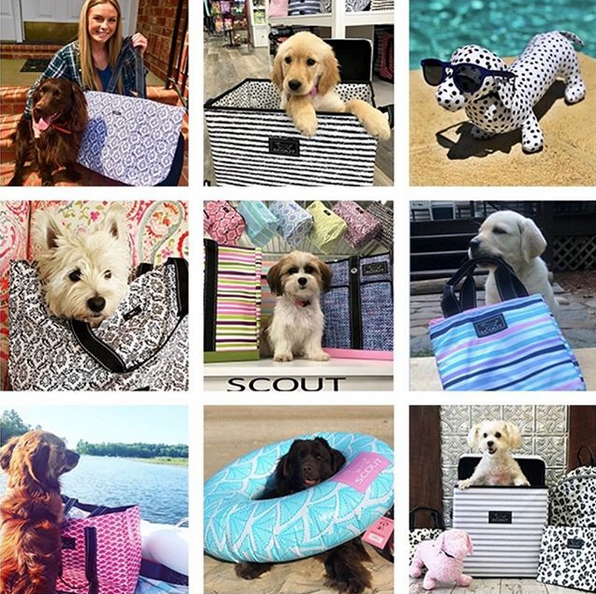 Scout Totes gets my unwavering loyalty as to some of if not the best totes out there, affordable, good looking and destruction proof…works for me! Thanks to Scout Bags for offering all Enchanted Home readers an extra 15% off all orders use code “enchanted15” Not too soon to be thinking about the holidays. Click here to visit Scout Bags and take advantage of the discount. Which 3 Scout items would you most love to have? One lucky winner will win one bag of their choice, any bag and any color! Just visit Scout Bags, take a look around (click here to visit their site online) and come back here to tell us your most favorite item or two. I will announce the winner on Sunday so do check back! Thanks for stopping in, wishing everyone a fabulous day and hope this last week of summer is a good one. Fall is almost here and I for one am thrilled! Love the coolers and the big four-boys bag! So many cute items! My favorites are The beach bag, cooler bag and the original Deano. Love all the patterns and colors! I really love all the totes. Thinking about the 4-boys in stripe for Christmas presents for my daughters. Great for the farmers market and when they come home and clean out my refrigerator to go back home. The rump roost makes a great storage container in your closets, garage, etc. Such a fun way to organize! Love the Scout bags! I think some would make wonderful bags for the grocery store, and then get rid of the tacky ones we use in place of the reusable grocery bags! I think I would love the 4-boy tote. I packed up my 2 large labs last week and headed north, out of the way of Florence. I had to pack several small totes to get all of their items together and it was a pain when unloading. I love Scout bags but need to get a larger one. I love the Deano and the Bagette. And I would get them in some of the lovely blue and white patterns or stripes! I love the BJ bag, and the pocket tote bag! I didn’t know anything about these bags until you brought them to my attention. Thank you for the information. I love the Original Deano in the “Hello Dotty” print! So adorable and can use it for EVERYTHING!!! I have had a Scout bag for years!! Who couldn’t use another? Love Errand Boy & Uptown girl in Nantucket Navy & royal highness! I love the Deano in the Royal Highness print! absolutely adorable. The 4 small boy is also wonderful, I can’t seem to get a large enough tote. I seem to always need a good tote and I love knowing they are durable. the overpacker would definitely be my choice, could use it for so many things…. I am having a difficult time just choosing one! I love the market bags for shopping and the travel bags. All the prints are outstanding and the fact that they are foldable is an added plus. Thanks Tina, for always introducing us to wonderful additions to our lives. Love the totes and am tempted to try the cooler. We are farmers and I deliver dinner to the fields during harvest. This would be perfect! I’m at the beach today using my Scout tote cooler. Love them all!! I’m planning a trip to Italy next April and the Daytripper bag looks perfect for my trip! I also like the 3 girls bag. Reasonable prices and darling patterns. The Scout bags are amazing. The Uptown Girl in chalk black is one of my favorites. Also, The Pocket Rocket in Black Knight looks quite fetching. Thanks for sharing your great finds, Tina. 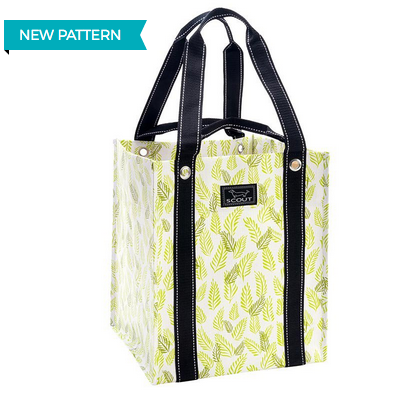 I love the larger totes, so perfect for groceries or anything. BJ Bag! The size and the pockets make it for me! My favs are the BJ bag and Uptown Girl. These are great bags and been eating one or two! My faves are the Petite Baguette and the Backstory (for lugging essentials while at Walt Disney World!). The rump roost storage bin , in the royal highness print of course ! It’s an easy (and practical) and gorgeous way to bring blue and white into a bedroom closet !!! Yes, please !!! Hard to choose… but think favorites are the Uptown Girl and the Pocket Rocket. Love them all! I like the original deano,and the bagette in royal highness, I can think of many ways this would be helpful in day to day use and so pretty!! My favorite is the 3 girls tote. Very roomy and very handy! I keep large Scout Bags in me car at all times. But, I really could use the Uptown Girl to go back & forth to my office. Oh my how does one choose – I like the BJ Bag, the DJ Bag and Beach Bum. At this point I would be happy with any of them, they are all so lovely and colorful. You always share such wonderful items. I would love the Rocket Pocket bag in the Royal Highness. Who doesn’t love a blue and white bag. What fabulous options. I like the Plus1, Deano and Getaway. All very functional and love the patterns. Thank you! I really like the Deano and the4 boys tote. So practical! The Errand Boy is my fav. I love Scout bags too! The Pocket Rocket and Petite Baguette for me!! I am loving the Scout Divide and Conquer bag. This is perfect for spring summer tees, swim suits, and coverups. I also love their original Deano bag. You really can’t go wrong! These are the best bags ever! I have several that I use all the time, and they are so functional, durable, and cute. For years I’ve used the BJ bag as our family beach bag, and it works perfectly. I’m eyeing the pocket rocket, plus 1, and a lunch tote to round out my collection. I think my favorite is the original Deano bag. I always make so many trips to my car, the bag would make me much more efficient. What a time saver! Thank you for introducing us to Scout bags. I really like the Uptown Girl bag to use everyday as I run errands and take boys to sports. I like the pocket tote. Love all the colors and patterns the bags are available in. Wonderful bags. I love the D J bag and the backpack. They are all so great. Hi! I have my eye on the Duffy for quick weekend trips. It’s the perydize? And of course in Royal Highness blue and white!! I may need two…one for me and one for my college daughter for her short flights home!!! Love all bags!! 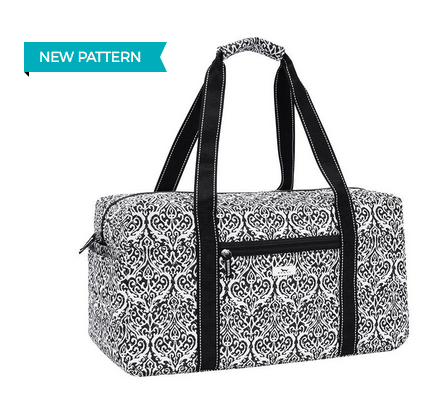 So many fun patterns with a bag for any occasion! First time to see these bags but already planning on how many ways I will be using them. I love all the bags!! My favorites are The BJ in Ren Roir, Large soft cooler tote in Chalk Board and the Duffle in Royal Highness. Great products!! I was looking for a light travel bag for airplane travel. I like the crossbody bucket bag but wish It had an outside pocket for water.. otherwise perfect. All of the bags would be useful. 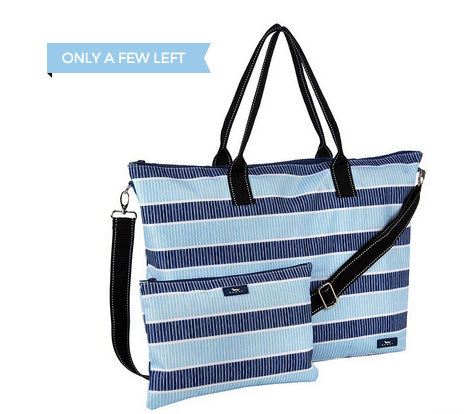 I particularly like the Nantucket Navy pattern perhaps on the “getaway” or BJ bag. Scout totes are really fabulous! Only problem is that my adult daughters keep “borrowing “ them. I love the BJ bag because of the exterior pockets for small or delicate items! I love the errand boy and the 4 boys bag. There are all so cute and functional! I love all bags but think the uptown girl bag is the one I would like the most. Love Scout bags! Have several of them and now have my eye on the large soft cooler! Thanks for reminding me I need to order! The bags are all fabulous but really love the 4 boys bag. I have three boys and two girls so my life is a continuous oversized bag affair. I can’t think of a more stylish way to travel. I love them! I’m a teacher and this would really help carry all my stuff. 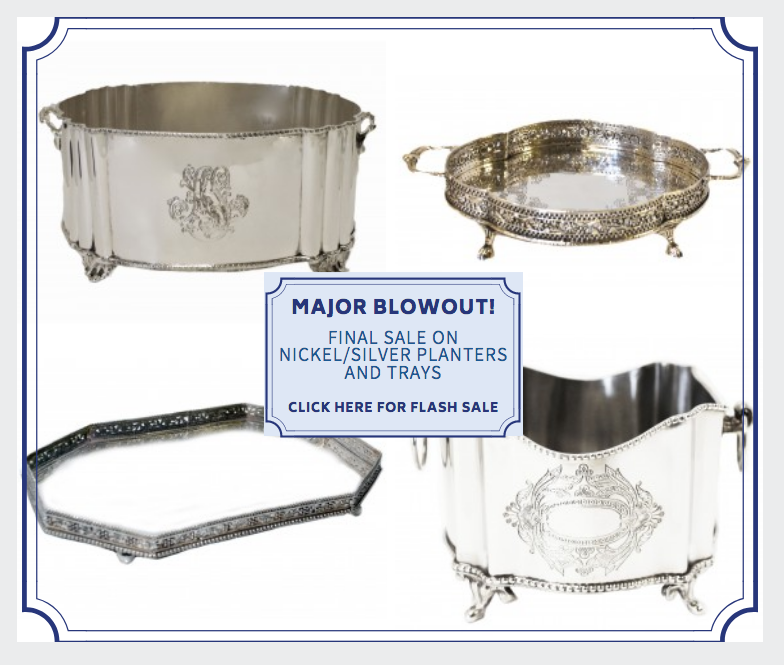 These are fabulous…thinking about ordering some as gifts for the holidays…ack, can’t believe I said that!!! I love the Scout bags! So many versatile styles. My favorite is the “Getaway”’ what a great bag. I also love the DJ bag, I see so many uses for this and the beach bag is great! I love the 3 girls bag! Perfect for packing summer picnic gear! I LOVE these totes. The Scout totes are great. The larger totes would be so great for those Target hauls!! I so look forward to reading your tips every week!! I love all the cute but practical travel items, especially the Over Packer bag. So hard to chose, but I must say The Original Deano bag or The Beach Bag in Royal Hyness is my absolute fave. I cant get enough blue and white and this print if fabulous. Thank you for this giveaway, so much fun picking! 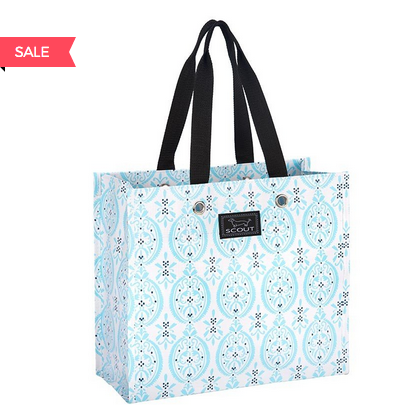 Three Girls tote is a perfect size and I would also find the Bagette extremely useful! Love the patterns. Love all the bags. 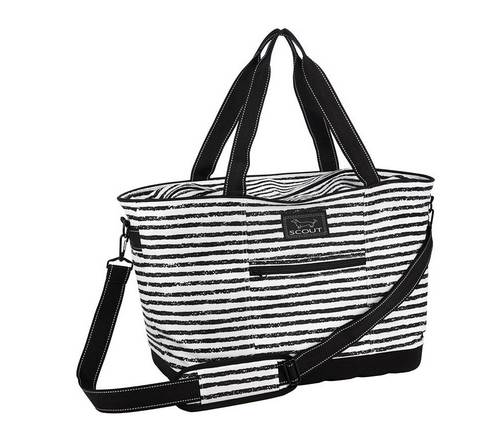 I would choose the Taylor cross body bag for travel…black & white stripe. 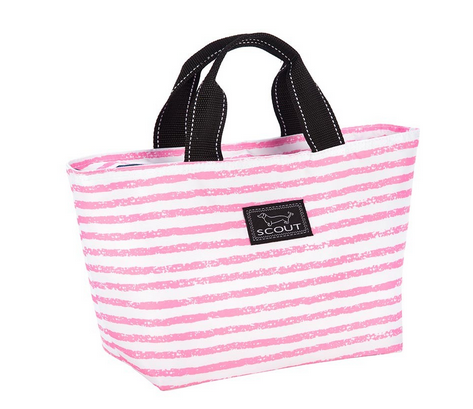 I love the Scout totes too! I have two that I use all the time. They are durable and the patterns are so bright and fun! I particularly like the Errand Boy and 4 Boys Bag. We have a cabin in northern Michigan and these would be great to bring items back and forth from home. 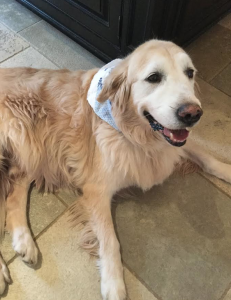 My choice of patterns ares Press Paws and Nantucket Navy. I love the scout bags!! Love the Uptown Girl in press paw and the Getaway in black knight. What a fun giveaway! I adore the 4 boys tote!!! So handy to haul everything including the “kitchen sink”. I would love love love the Beach Bum bag or 3 Girls Bag. My daughters love theirs and I’ve wanted one for some time! Thank you for the opportunity Tina ! I would like the “icebreaker”. I like to keep coolers in my car so I can keep frozen foods cold on the trip home from the grocery store. I love bags #6, 7 & 8. They would be perfect for my needs right now. With an empty nest, I now visit my triplets boys at their homes…..thank you. 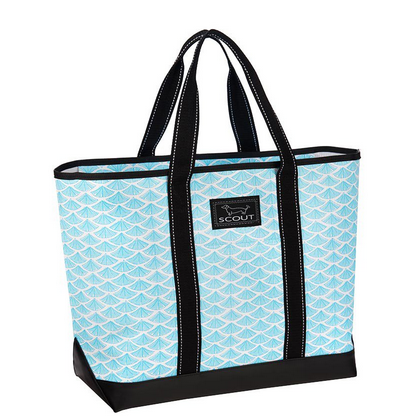 I love the picnic totes!! Great selection of colors! I like the classic uptown girl bags. LOVE Scout and have been a fan for years now! Other than sensible reasons for their practical living bags…its the prints. So many awesome prints. And, of course the sweet mascot. 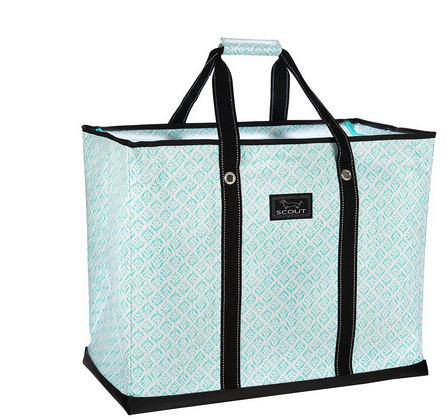 IF I could I would have one of every bag they make…totes, weekender, picnic, and home storage bins. Rugs, and cooler bags are my fave. Like the Knotty by Nature, The Stiff One, Thelma and Louise, DJ Bag, Beano…so so so many. The challenge is the choosing of prints. 🙂 Thanks. I’m taking advantage of the discount and free shipping today to start my Christmas shopping! The Pocket Rocket (great for bottles of wine) and Baguette bags would be great gifts for my daughter who lives in New York City and my other daughter who is just environmentally conscience. I may have to order a couple for me, too. I love Uptown Girl. Think I’ll order Christmas presents for all the ladies in my office. It is very difficult to pick just one or two items from Scout to pick! But I love the storage items for home organization and I saw a file tote item under office management category, that I could easily use to carry/store my needlepoint projects-all in one spot and safe! I have to spend more time on this website! 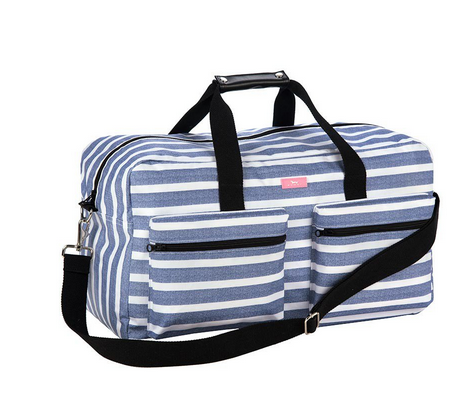 I am always in search of a great bag for hauling….I like Uptown Girl and Petit Baguette in Stripe Right. You can’t go wrong with a beautiful navy and white stripe. Thanks for sharing. I was unaware of this product until now. I love them all but would use the travel crossbody immediately! I’m always toting so much around these days and love the Scout bags that I do have. I would love to have a Deano bag and the 4 boys bag would be a Godsend for me!!!! Always love coming to your site to see more and more beautiful things!!! Thanks so smuch for introducing me to these great looking bags! I especially like the Three Girls Tote in the College Rule pattern. I love these bags. Bought my first one years ago because I have a Doxie and loved the logo. The original Deano is one I’d love to have. Love “the errand boy”! I had the original & my daughter took that years ago when in college. Lol, lots of things have disappeared over the years. I would LOVE to own the Errand Boy or the 4 boys tote…. I am always needing a large bag for something! Love these bags! I’m eyeing up the Uptown Girl and the Beach Bum! My favorite is the Prep Cool. I love the different patterns it comes in. Thanks for introducing us to Scout Bag. I have the pocket tote in a blue/white pattern, of course. I enjoy using it for football tailgates. Others I could use are the errand boy and four boys. Thanks for sharing thoughts about these wonderful bags. I love the Hepburn bag and the large rugs! Will you be getting more of the ice buckets with the rattan handles? I love it and it’s sold out. I like the BJ bag and uptown totes – it’s all about the outside pockets! Love them all. Every bag is practical and beautiful! Oh my goodness ! I love Scout bags and have bought them for gifts in the past, but never for myself. I did not know they had rugs and I would love to order some for my mudroom, pantry and kitchen. A new bag would make me happy happy ! Great bags, ordered 4x deano. Thanks Tina. How cute! I love the Duffy – how great for short trips! I love the preps cool scout bag with outside pockets. So smart and handy for shopping! I love the duffel bag. It is perfect for weekend travel!! I like Tally girl. Thank You for the chance to win one of these totes. Love them all but think the cooler bag is great! Love the errand boy tote. Perfect for a picnic too! The beach bag is wonderful and useful for so many things! I can’t make a choice between Uptown girl or Three girl bag. I have a small cooloer and LOVE it! Such good quality. My daughter and I both love Scout bags! The BJ bag looks perfect for many uses. I own 2 Pocket Scout totes (#12) and I adore them…would love to add one more to my collection! like the beach bag and the cooler bags! I love the 4 boys bags!!! I like the 3 girls bag. Love the 4 boys tote. Great size and quite versatile! Thank you for introducing us to Scout Bags! Hi Tina, as always bringing beutiful things. But….definitely 3 girls tote…. 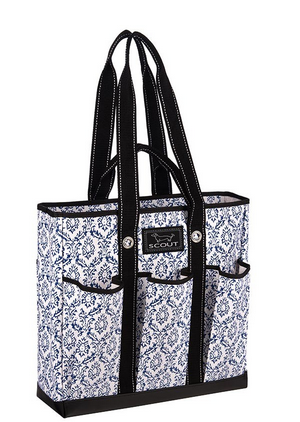 Hi I like the duffel bag in the lovely blue and white pattern! So nice all of them! Great gift idea! I love “the stiff one” cooler that I saw on the Scout website. I am always looking for something attractive to carry to the warehouse store (Costco, Sams, BJ’s) to keep my frozen and cold foods at a safe temperature on the way home. I also pack cold foods to serve my grandkids every Friday when I babysit and a Scout cooler would be perfect! 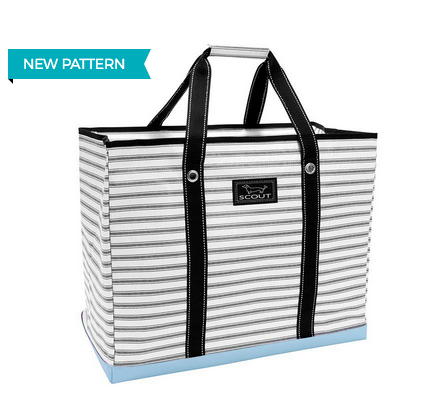 Really like the extra large tote because I can use to carry food to my customers at work ! Love the pocket fronts and the weekend style. 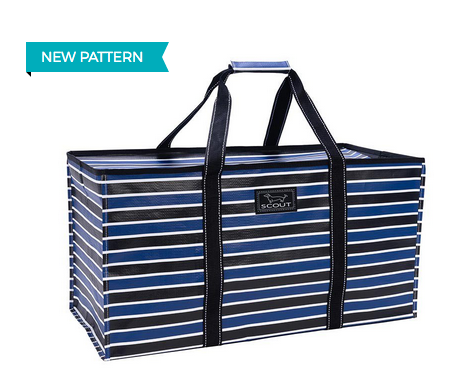 Love the 4 Boys Bag…just what I need for my upcoming trip cross county…and one of the coolers would be great for the car! LOVE the getaway in Black Knight! I have a lot of totes, but there are some practical ones here I am missing. Love the Black Knight Getaway! The winner is the Nooner Lunch Box! I love the look of the weekender in cinamon stix🤩🤩very nice bags. I own several Scout Bags and use them all year long. I really like the Uptown Girl in Pocket Tote in Ren Noir or Fleetwood Black and the Fit Kit Gym Bag in Oxford Blue. These would be great additions to m collection. Thanks for sharing. Love the BJ Scout with pockets to use as a portable office! I WOULD LOVE THE DJ BAG- IT WOULD BE GREAT TO BRING THINGS BACK AND FORTH TO WORK- ESPECIALLY IN THE WINTER WITH SHOES , SWEATERS AND SUCH! THANK YOU FOR THE CHANCE TO WIN A SCOUT BAG!! THEY ARE SO NICE!!! Love the soft sided travel bags. They look very easy, comfortable and stylish. Love the Scout storage boxes in a playroom to store children’s toys or used as storage for dorm rooms. 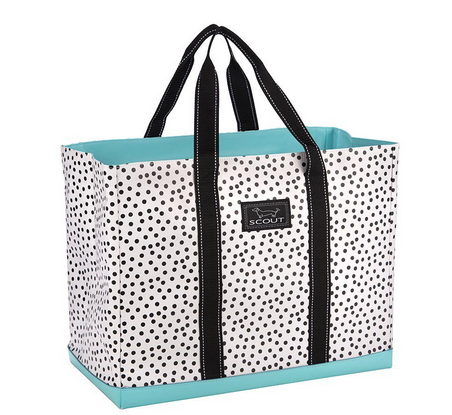 The classic totes are always useful for everyday trips to the grocery store, organizing small items in your vehicle or a trip to the beach. Love the style of these bags, so many ways I can think of in using them. They’ll definitely come in handy. Where can I get that wrapping paper?! Wow – just visited the Scout site and I’m getting too many ideas! I may have to start with the BJ bag, but definitely need that errand boy in the back of my car! My friend uses a Scout bag as her tennis bag. It works perfectly! Absolutely love the duffle bag! Their coolers totes are so wonderful. Scout Bags have been on my wish list for months! Thank you for the reminder and an opportunity to win one. All the totes are cute and so useful! Love the wine bag. 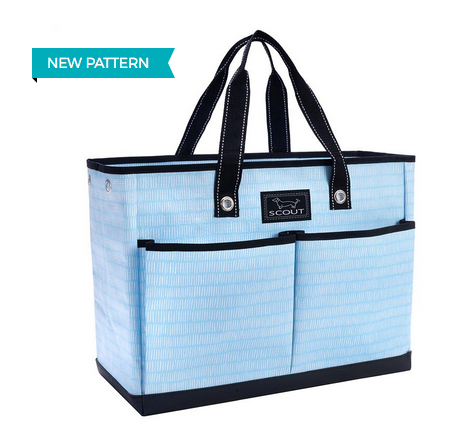 I’m in love with the cooler tote! Ingenious! How did we live without this lightweight, easy to store and attractive item? Would love the Deano and the 3 boys tote! I need the overpacker and want the uptown girl but can’t decide on a pattern. All so cute! What precious and practical gifts these Scout Bags would be! 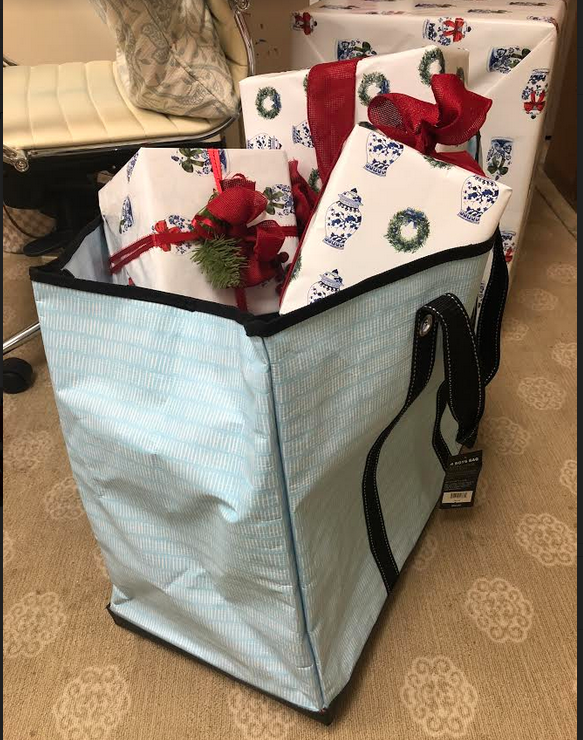 I especially like the BJ, Four Boys, and Uptown Girl bags…….anything in blue! I would love the uptown girl or the deano bag. Thank you for such a great give away! My favorite is Deano in one of the blue and white patterns. Love all the prints and patterns.